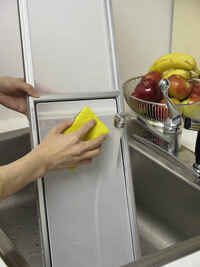 Installing a MicroAirScreen should be relatively easy. For a sliding or double hung window just open the window, place the ADJ (adjustable) MicroAirScreen unit into the channel that the window itself guides in, adjust until both ends are into the opposite channels and then close the window up to the MicroAirScreen. For a sliding window the MicroAirScreen is vertical and the little stop knobs should brought up to the opposing frame and tightened to keep the upper leaf from shifting downward. Installing a FIX (fixed - not adjustable) MicroAirScreen (MAS) unit into a sliding window, either slide the top of the MAS unit into the top channel and then drop the unit into the bottom channel OR if there is not enough room between the top and bottom channel to insert the MAS then put the bottom of the MAS into the lower channel at an angle and rotate the MAS into the upper channel. Then close the window up to the MicroAirScreen. A piece of foam rubber is packed with the MicroAirScreen to use if there is a gap left between the partially open window leaf and the adjacent window pane. Generally the MicroAirScreen needs only be periodically rinsed off in a sink, or if a large unit in a tub/shower washed off with a soft sponge or rag. They can be washed with a general kitchen sink type soap such as "Polmolive" or sprayed with general cleaners such as "409" or "Fantastic" and then rinsed off. If an ADJ adjustable MicroAirScreen unit does not slide smoothly, then a little spray of silicone in the slide track groove as indicated (4 points) and then slide back and forth should make it smooth again.